Birds is pure pokie fun, no traditional standard paylines just a five-reel pokie with three rows. Birds was evidently developed with an entertainment first approach. Betsoft created an actual game for Australian players to enjoy not just a pokie with a theme. The online pokie which is available in both real money mode and the free-play mode is stacked with bonus features that all pokie lovers will flock to. Clearly as the pokie name gives away, Birds is filled with everything avian. The pokie does not have traditional reels or any spinning motions. It’s referred to as a five-reel pokie because there are five birds across the screen that sit along a wire between two street lamps. All game symbols are birds, the wild symbol is a wildly colourful bird. There is no scatter symbol in this casino game . The bonus features in Birds, follow a simple concept. A minimum of four winning combinations will earn players eight free spins with six wins earning 20 free spins. At seven wins players earn 14 free spins along with the number of winning combinations accumulated so far. Free spins can be retriggered during this round. Additionally, there is a gamble feature which gives Aussie players the opportunity to double their winnings. Bet either heads or tails on 50% or all your wins. This is a big risk to take; however, if you win the rewards are worth it all. 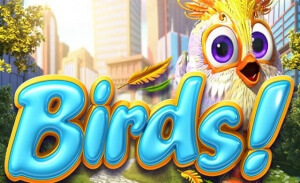 Birds is nothing like a standard pokie game with spinning reels and multiple paylines. A simple entertaining game for veteran pokie players and new players. Betsoft balances the simplicity and moderate earnings in this pokie game with the huge entertainment value and stunning graphics. Give Birds a try at the top Australian pokies casinos on onlinepokies.site .